The album cover of a young man looking onto a mirror and seeing his aged self caught my attention long before I even played the CD and the music really lives up to excellent the artwork. Like most musicians of his generation Matt Andersen started out listening to Rock music in his youth which developed into a Clapton obsession that led him to BB King and a love affair with the Blues. 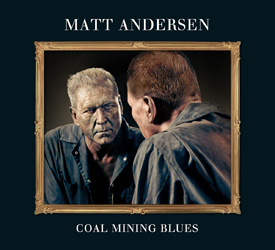 That background and a blue collar working class upbringing has come together to create an excellent third album of story telling Blues that stands shoulder to shoulder with his peers and heroes. Most of the songs on COAL MINING BLUES are based around the lives and loves of working people and a couple of tracks truly are exceptional. Title track Coal Mining Blues is real slow burner with an organ and piano shoring up a beautiful tale like a couple of pit props. Andersen’s voice eases effortlessly between a rumble and a growl but every word is enunciated perfectly and his guitar playing is as good as I’ve heard this year. Things pick up on the toe-tapping Heartbreaker when his powerful voice comes into it’s own on a track that could easily have come out of Sun Studios. COAL MINING BLUES ends with the unhurried Soul meets Gospel Feel Like Going Home which made me do a double take as it sounds exactly like Joe Cocker in his late 1970’s peak and I can’t pay Matt Andersen a finer compliment than that. The song is genuinely spine tingling and will reduce grown men to tears.